I have to say, this is an unusual eruption pattern of the second and third molars. Can you tell what is not quite "right"? I'm guessing those teeth at all different angles are the problem here. Looks like my teeth before braces. I'm no dentist but it looks like the wisdom teeth are blocking the 12 year molars. Don't these usually erupt before wisdom teeth even become an issue? Nice Post Dear Keep it Up. I wish I could email you instead of posting this on your blog. I took my 4 yr old son to have his tooth pulled last night. Despite my best efforts w/ brushing..he still got cavities. Grrr! Anyway, I was expecting some kind of sedation for him, but the Dr didn't use anything. He also didn't use any topical numbing medicine before he gave him the 2 shots of novacaine because of "where it was located". (It was his first mollar removed). This of course hurt my little boy...and the entire experience of my husband AND myself having to hold our screaming son down in the chair while his tooth was twisted and pulled out was horrifying to say the least! He still has to have a spacer put in and 3 smaller cavities filled. There's no way I'll get him back in that office! He's scared to death and I don't blame him! I'm looking in to finding a dentist that will sedate him somehow (we have state insurance so this is a challenge). Anyway...I'm still angry and confused as to why at least no topical numbing was used for the novacain shots? It didn't seem like a difficult or awkward area to treat. Does this sound right to you? Pamela, Hate to hear of your experience...Many kids do benefit from sedation, so please feel free to read all about that here on the blog. Most Pediatric Dentists used conscious sedation in some form. I would seek one out. As far as dramatic reactions, I have seen kids "freak out" with if you will, just by placing a soft cotton Q-tip in their mouth. Age is also a factor in reactions--see my posts on behavior and how kids tend to do in the dental office here as well. Good luck. Its look likes a big problem in teeth. keep cleaning the teeth in any dentist salon. From simple check-ups and cleanings to full mouth makeovers with implants and veneers, you can have all your dental needs taken care of at one convenient location. I hope you don't mind me asking a couple of questions. My 4 year-old daughter's new pediatric dentist doesn't want to take xrays. The dentist does not have the xrays from her old dentist, and she does have a history of dental problems. On her first visit two of her back metal crowns were hurting (they're molars and side by side) and he just shrugged and said don't worry about it, it'll go away. So I insisted he at least take xrays of them. He did and said he didn't see a problem. But then before he sees her on the next visit he tells us there's a cavity on one of her back teeth. So I tell him I'd like him to take xrays of her front teeth too now, and he said no! He said he could see all of her teeth in the xrays of the back (not true) and he said he would see any cavities with a visual exam. Then he fixed her cavities without novacaine. She screamed through the second one. When I asked him why, he said because of her condition (she's a t ype 1 diabetic) he didn't want to risk giving her novacaine. And a month after her first visit she still has pain in her two metal crowns when I lightly brush around them. Is any of this normal? I can't switch dentists because we're on medicaid, and he appears to be the best of the sorry lot we have to choose from. Can you give me some advice? Thank you in advance. I cannot say whay a particualr dentist would do or not do something..There are cases where a young child might not be able to tolerate x-rays (gag reflex age or anxiety). In addidion, sometimes there is no need right away-developmentally speaking, but maybe later on. If teeth are spaced out a lot, you actually can see and probe them without x-rays (which are helpful in seeing when teeth are tight together). If you took x-rays in that case you might be looking for something other than cavities. As to novacaine or not. Every case is different. As I have mentioned on the blog elsewhere, most of the time we will numb up the area for a filling especially if there is a large cavity and certainly for extractions, etc. Occasionally, we do small fillings without injecting novocaine-these are very small cavities where we think the child will do quite well without. I know that sounds weird, but it can work quite well. No need for a "shot" if you really don't need one. Still, if I ever think a child needs to be numbed up we do it. I do not recall any medical reasons not to do so. In my mind, diabetics can be treated much like most kids if their blood sugar and insulin are well regulated. An interesting and rare eruption abnormality. Perhaps some kind of primary eruption failure, I cannot say anything more without an anamnesis in this case, but I would be cautious removing those wisdom teeth especially on the lower. The second molars might be ancylosed or else they should be erupting long before the 3rd molars fully developed. Careful, yes, that was our observation as well. I am wondering if you can help by answering a question for me. Two of my sons appear to have supernumerary teeth. They are aged 10 and 8.5 years and have not lost their top incisors yet. There is no sign of any adult teeth emerging. X-rays seem to show up to2 extra teeth in each case, but our dentist says he's not sure because he hasn't seen anything like it before. I am currently awaiting an appointment with an orthodontic surgeon for both sons (I live in the UK). Now for the question - My oldest son is 13. He has four adult teeth on the top and four on the bottom, but has not lost any other primary teeth. He has 24 teeth in all and his mouth looks full. Given the situation with his siblings do you think I need to insit on a referral for him too, or is it normal to have only lost 8 primary teeth at age 13? Thank you, best wishes, Annie. Many times kids have a slow eruption pattern and will not loose all their baby teeth till after most charts will say (about 12 years of age). So I would usually take a panoramic x ray to see what is there (or not). Some kids do not loose all their baby teeth till age 14.
i guess that needs an operation, right? Very interesting OPG. Was there pericoronitis associated with those impacted mandibular molars? Were they symptomatic? What was the course of treatment? I'm a 4th year Dental student in New Zealand currently studying for my finals and in my study related procrastination I came across your blog, it is very informative and well explained! I have a few questions I was hoping you could help me with: Are infraoccluded teeth the same as submerged teeth and caused by ankylosis? If so what is the course of treatment for an ankylosed deciduous maxillary lateral? - if you extracted would you risk mesial drift of the canine? If you had to extract a deciduous first molar would you risk mesial drift of the deciduous second molar or distal drift of the deciduous canine? And finaly, for crossbites in the mixed dentition, what are the indications for rapid maxillary expansion and slow maxillary expansion? Some sources say rapid should not be used in children younger than 9 or older than 13, is this true? Any help would be greatly appreciated! thanks very much! Unfortunately, I have the same issue with my second molar and third molar crowns facing each other. Out of curiosity, what did you recommend to your patient after seeing this? Consultation with the oral surgeon would be recommended in cases like htis, and that is what we did. There was some concern about removing everything at once as there is really not much bone there--thus risk of mandibular fracture. It turned out to be as best I remember, a two surgery thing to remove the impacted teeth. Chez, I got your post with your e-mail, but I do not communicate with that and I didn't want to post your e-mail if you did not intend it to be here on the web. About third molars: I cannot really advise that you should immediately get something out or not. Your dentist has the most information, x-rays, clinical exam, and years of experience with you to recommend treatment. Still, many third molar situations can wait a while. Some studies show that not removing impacted third molars causes minimal problems or none at all. Every case is different. Unless you are paying the bill yourself and employed and out of the house (I gather you are an older teenager), parents are going to have to make the call on things like this. As a parent myself I know the financial part of decisions are very important--other issues of critical or urgent treatment verses "can it wait a little while" treatment--well... I am more strong in my recommendations when a patient is in pain or if I think waiting may cause additional problems (your dentist can advise on that). So, talk about it with your parents and your dentist. Our two year old daughter was born six weeks prematurely. Other than a tongue tie and the late development of speech, she is thriving and measures at 97th percentile height and average weight. She now speaks (at last!) and does so in 8 word sentences. We've noticed over the last year that her teeth came in at an unusually slow pace compared with our other children. There are four "missing" teeth, two on the top (parallel to each other on either side of her mouth) and two on the bottom (same position). We thought they just hadn't come in yet. She's been chewing on stuff like crazy though so I felt in there tonight and to our surprise, the four teeth ARE coming in - but in the wrong place. They are all poking straight out from the sides of her gums, underneath the other teeth that have already come in. There is not going to be enough room for them to come into their 'right' position. I'm making an appointment for her to see an orthodontist and get x-rayed but I am wondering what is standard procedure for an unusual situation where baby teeth don't come in correctly and instead break the gum in the wrong places. Will she need to undergo general anesthesia or are there other options? The teeth have almost fully erupted form her gums now. Thanks so much for your time. I'm glad I found this blog! Did you say two years old? I have never had a patient two years old (or thereabouts) that ever needed any treatment or intervention for erupting teeth other than newborns with what they call natal teeth (that is they were born with a tooth that causes problems). Some kids have missing or extra "supernumary" teeth, but that is usually not a concern till they are older. An extra tooth can make things look a little out of the ordinary. There are some rare conditions where something else is going on, but 99% of the time there is no real concern. I would suggest a pediatric dentist take a look just to rule out anything unusual. By the way, most of the time, a two your old will not cooperate for x-rays. I'd be interested if you were to share the results of your inquiry. Good Luck! This looks familiar. 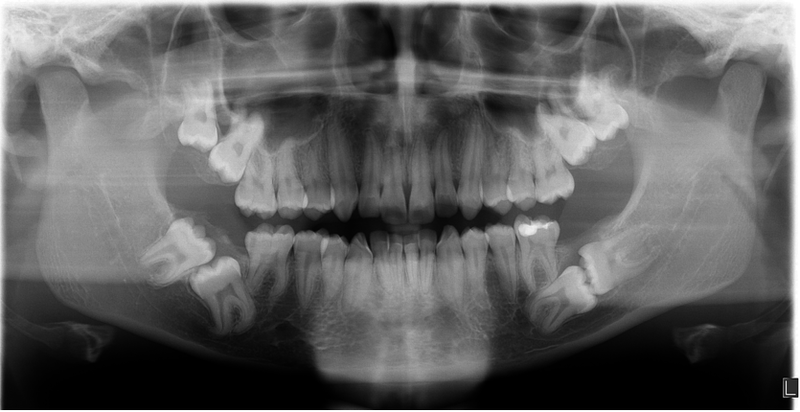 My child's pan x-rays show that his bottom second molars are partially erupted. The top second molars have not erupted and have some way to go. The bottom second molars seem to be very slow in moving upward, and haven't moved much in months. The orthodontist has recommended extraction of the wisdom teeth to allow the second molars to erupt. The oral surgeon says it is unlikely the wisdom teeth will ever erupt. Everyone talks in legalese and no one seems to want to commit to anything ("oral surgery is elective"; "orthodontics are elective"). My understanding is that there isn't enough room, top or bottom, so extracting the wisdom teeth would allow the second molars to come in fully on the bottom and to finally come in on the top. The wisdom teeth are impacted, so they will "need" to come out at some point. This would be preferable before my child reaches age 18 and no longer has his parents' dental plan. 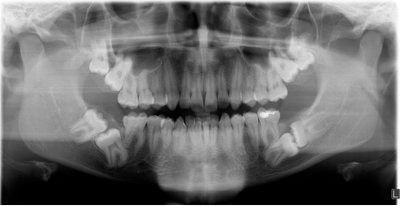 The bottom wisdom teeth are also angled in towards his second molars. It would help to have an expert opinion of what is medically preferable instead of "it's up to you". I'm not a medical professional with extensive training. Wait a couple of years or take them out now: that is the question. I think they'll have to come out at some point, but what do I know? If an oral surgeon does not want to do treatment because a patient is too young, that sounds like it's wisdom teeth. Sometimes they will say that if the wisdom teeth are small, way up in there because they have not developed enough, so it's surgically difficult to get up in there. That is not unusual. Waiting makes them easier to remove. If they feel uncomfortable doing treatment I'd be cautious and perhaps get more information. IN another case, orthodontists remove erupted first or second molars for orthodontic reasons (not the wisdom teeth) That is an orthodontic question. My daughter, age 12, has beautiful teeth, with a perfect record. No cavities, nothing. However at our last visit, our dentist recommended crowns for all but 3 of her teeth. I said no, after taking her to 3 other dentists who said there was no problem. We switched dentists. I was wondering what to do about her front 4 teeth, they have a greyish outline. Her teeth aren't yellow, but they aren't perfect white, I wasn't quite sure what this was or what to do about it. Any suggestions?